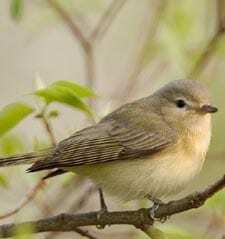 The rich song of the Warbling Vireo is a common sound in many parts of central and northern North America during summer. It’s a great bird to learn by ear, because its fast, rollicking song is its most distinctive feature. Otherwise, Warbling Vireos are fairly plain birds with gray-olive upperparts and white underparts washed with faint yellow. They have a mild face pattern with a whitish stripe over the eye. They stay high in deciduous treetops, where they move methodically among the leaves hunting for caterpillars.